In this episode of Manufacturing Tomorrow's Workforce, Christine LaFave Grace, managing editor of Putman Media's Plant Services magazine, interviews Chandra Brown, executive director of the Digital Manufacturing and Design Innovation Institute (DMDII). They talk about how combining innovative digital technology and workforce development can make U.S. manufacturing more competitive. Here's a snippet from their conversation. CHRISTINE LAFAVE GRACE: U.S. manufacturing enjoyed a pretty banner year in 2018, but manufacturers are still contending with a few pretty significant challenges. Among these, the dual challenges of No. 1 filling their workforce pipelines to replace retiring baby boomers, and No. 2, trying to figure out how new digital technologies can help them do things differently, whether that's maintenance management, or budget forecasting, or adopting service-based business models. How can they balance these challenges? And how can tackling both workforce development and digital simultaneously help make U.S. manufacturing more competitive? 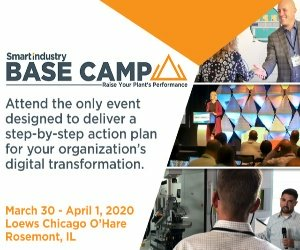 I'm Christine LaFave Grace, managing editor of Plant Services magazine, and to get perspective on those questions today, I'm talking with Chandra Brown, who took over in September as executive director of at the Digital Manufacturing and Design Innovation Institute in Chicago. Previously, she served as Deputy Assistant Secretary of Manufacturing in the U.S. Commerce Department under President Obama. And before that appointment, she had worked for 19 years at Oregon Iron Works. Chandra, thanks so much for being here today. CHANDRA BROWN: It's a pleasure, Christine. CLG: Alright, so from your perspective, how does workforce development fit into the puzzle when it comes to helping manufacturers move farther down the digital path? CB: Workforce development is absolutely critical to the future competitiveness of manufacturers in the United States. So, we think it does not only fit into the puzzle, it is probably one of the most critical pieces of this puzzle. We know that a strong, skilled workforce is critical for the implementation of digital technology. They go hand-in-hand. And I think that one of the common misconceptions is that digital is all about automation or talking about big data, but in reality, it is about the workforce just as much as it is about the digital side. None of it is possible without our people. That's the most important asset we have at a company. CLG: Right. And it's such a challenge when it's hard to get people in the door in some cases, to get over the misperceptions about manufacturing careers. What are some of the things that you see that U.S. manufacturers are struggling with, or the kinds of skills they need, or maybe even how they can reach out better, to say 'hey, this is what a manufacturing career in America looks like today, and come be a part of this exciting future'? CB: Absolutely, because it is such a bright and growing future, and we know we have pipeline issues. So, the perspectives that are really needed today are around agility, and you need to realize that digital technologies, they can be applied to every stage of the manufacturing life cycle, so they cut across everything, and a lot of people don't realize that it's not just on a future factory floor, or in your IT or cybersecurity department, right? It's across the board. So, every manufacturer really has to assess where they have their problems, where they have their expertise, and apply it across. I'm really proud because your question is such a valid one. We here at the DMDII, the Digital Manufacturing and Design Innovation Institute, we created literally a jobs taxonomy. It lists roughly 165 roles and talking about the roles of the future, because we want to help companies. Sometimes they don't even know what they're looking for; there's new jobs like digital ethicist, you know and things that people haven't even thought about. So, it's publicly available, anyone can go look at it on our website. So, that's one of the ways we're trying to even help define, what are these future jobs? Want more? Listen to the Manufacturing Tomorrow's Workforce podcast now!